The day didn’t really start, since the previous one never really ended. Trying to fall asleep in the tent the night before, in the total silence and freezing temperatures I barely closed an eye and hoped for the morning to come quickly. It did, but other then I had thought. No sun warming me up, but rain complicating the packing of the tent, breakfast and everything else. At 08:00 I was on the road and initially made slow progress. The weather stayed bad, with light rain and a grey sky. I crossed several rivers easily, then found myself at what the GPS showed as a small flow of water, but what in reality was the biggest river so far. I tried to find a crossing for over an hour without success, the water was too deep, the river too wide, the ground too muddy. Finally a bridge came in sight, I crossed, and then had to drive all the way back on the other side of the river. Having lost two hours and not really moving forward, I tried to speed up, with dismal success. The tracks were just too bad, small, and bumpy. At around lunchtime, driving through a lovely landscape, I met a Swiss couple in a blue old Toyota Landcruiser, Andreas and Katrin. 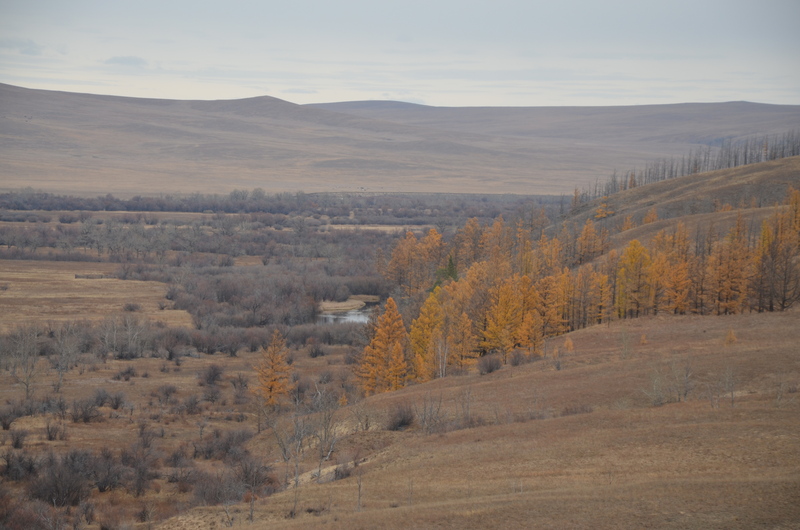 They also had left Europe in April, but were taking it a lot slower to discover countries properly, and had been for 6 weeks in Mongolia alone. 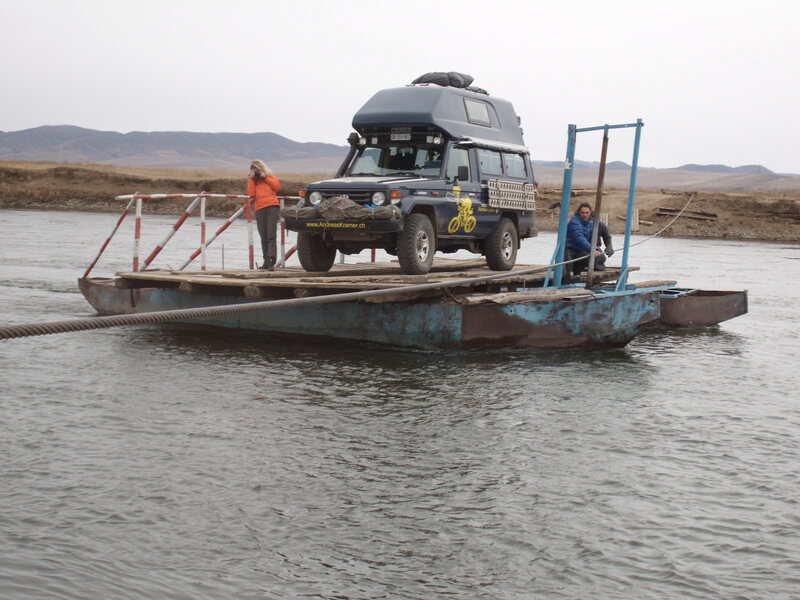 After chatting a while it became time to move on, for both cars, and we rode within sight until we reached a river with a makeshift raft and a yurt. A woman that came out of the yurt said something in mongol they we didn’t understand, and then took off on a horse. From another direction, a tractor was approaching, and a guy jumped off and started to prepare the raft for the crossing. I was the first to get on the raft, compared to the lake crossing in Pakistan this was peanuts. The mongol guy unto we’d the raft and had to pull an iron rope to move it and get to the other side. In less then 5 mins it was done, the whole procedure was surprisingly quick. On the other shore a Landcruiser was waiting to be taken back, and then it was Andreas and Karin’s turn to cross. The guy wanted 10.000 MNT per car in cash. We paid, left together and rode close for a while. Then my new Swiss traveller friends took another track, and I lost them out of sight in my rear window. The track got worse, and I crosses another water and some muddy parts easily, until I reached an extended stretch of mud and track submerged by water. I tried to take it with cautious speed, but the stretch was too long and I got stuck. Panic! 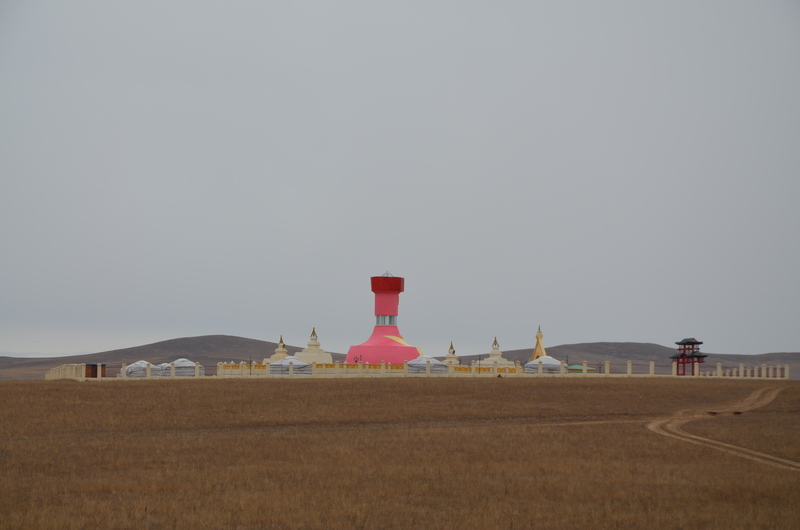 The car stuck in the middle of nowhere in Mongolia, I was surrounded by water, had no phone coverage, and no clue whom to call even if I would have had it. I tried to free myself slowly from the mud, but the car didn’t move. I didn’t have the time it panic seriously that I saw the blue Landcruiser at the horizon. Angels sent from heaven! In a five minute operation Andreas towed me out of the mud, and off we went together again. What a luck, I was so relieved! We crossed another river, and more muddy stretches. The guys we had met at the ferry had told us to stay on the left at the muddy places, and we thought that after a river and some stretches of muddy and watery track we had seen the action ahead. 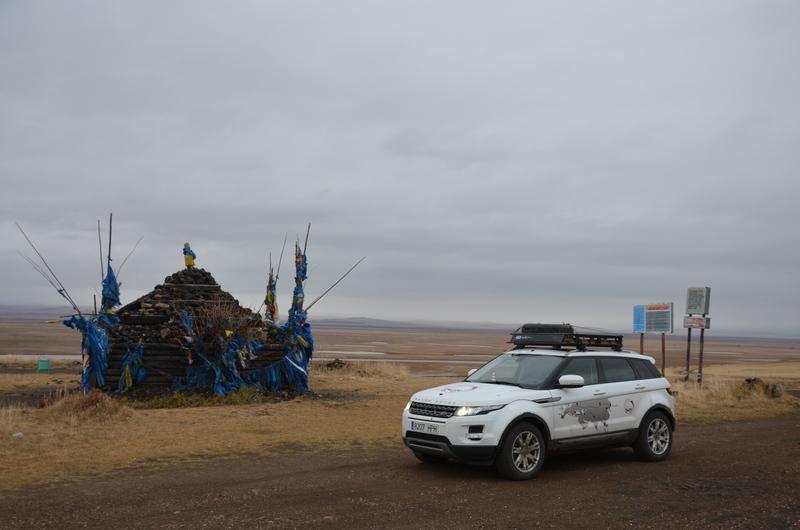 The next town, Dadal, the birthplace of Chinggis Khan, was just 19km away, when suddenly the Swiss Landcruiser got stuck in the mud. I was driving behind them and immediately turned left, where I found a safe, dry stretch of land. We started a rescue operation, although the heavy vehicle was buried pretty deep in the mud on the right side. With my Evoque I couldn’t tow them out. We tried it from the front and back several times, but had no luck, even using their sand tracks that we dug in as good as possible. 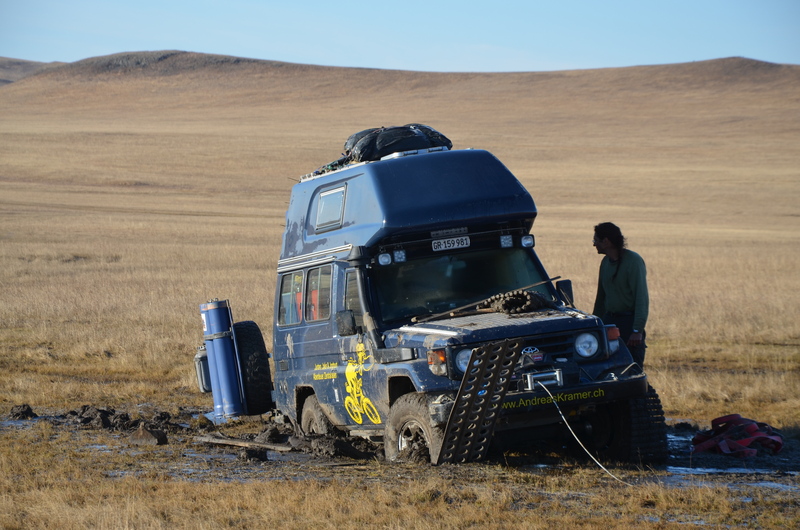 We then tried to make them tow themselves out using the winch on their car and mine as the obstacle to fix the cable to. I drove to the front, at some 20m distance from their car, and we tried the trick. It didn’t work. We wanted to do the winch trick from their back. As I wanted to move backward to drive around their car, I got stuck too. What a mess, both cars were stuck in mud, around us was just steppe, and we were walking on mud covered with water. We tried to free the cars in all ways until night fell. At zero degrees it was so freezing cold we decided to abort the operation and resume in the morning. In the Evoque, I turned the heating on, changed boots, socks and trousers. Dinner was just a hot soup and tea. The car was so full with luggage that sleeping in it meant basically sitting on the driver’s seat. The night will be horrible, I’ll dream about the tent the night before! And I really hope we can get out of here tomorrow morning to end this horror trip.